Politics has always been a story of greed and diplomacy. Claire Underwood has taken the whole concept of political ambition to the next level with hues of power-hunger, deceit, ruthlessness and unapologetic attitude of stopping at nothing to ensure her rise to supremacy. 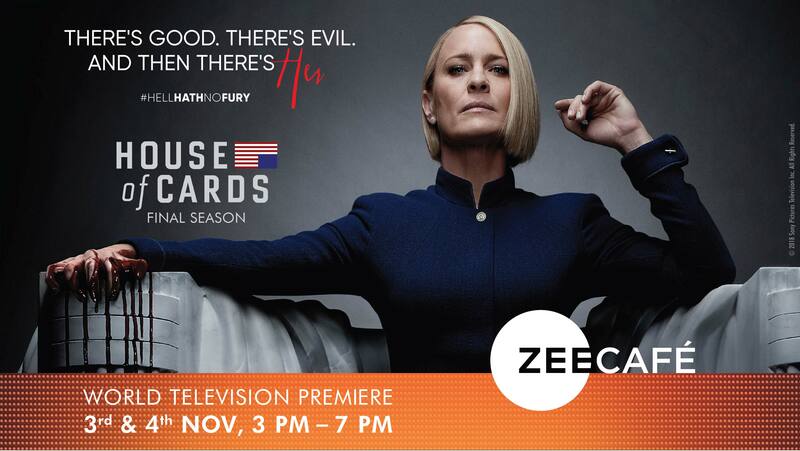 A day after the international release, Zee Café is all set to bring you the World television premiere of the final season of house of Cards with even more gruesome twists and harsh turns in Claire's political gambit. With the campaign proposition #HellHathNoFury, the channel depicts the edgy and beguiling side of the power-woman in the upcoming sixth season. The superhit political drama will have an exclusive television weekend-binge on Zee Café, on November 3 and 4, 2018. The Emmy and Golden Globe-winning political drama, which is a relentless exploration of power and ambition in a harshly American way, will premiere on Zee Café with a finale weekend marathon. The channel is giving the viewers an opportunity to watch their favourite show in the comfort of their home. Abstaining from the conversations about the misconduct that led to the ouster of the actor playing the lead character of Frank Underwood, Robin Wright is all set to take the driving seat reaching and staying at the helm. This is the first season where Spacey is missing, who was shown to have died at the end of fifth season. Ending Season 5 on a high, the final season with new actors Diane Lane and Greg Kinnear playing key roles, is set to grip viewers with the intriguing course of journey that unfolds for the bold and edgy character of Claire. Keeping in line with the proposition of the season closure, Zee Café has chalked out/earmarked a robust marketing campaign around #HellHathNoFury. The channel will be engaging its viewers through a high impact campaign across television, print and digital mediums in key mega cities. The channel is creating engagement through social media and influencer activity for the much talked about property and its much-anticipated finale. 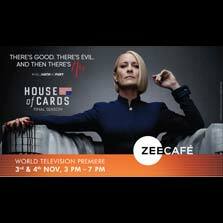 Tune-in to witness Claire Underwood unfold her ultimate moves with the final season of House of Cards on the weekend of November 3 and 4, from 3PM to 7PM on Zee Café.